Westfields are the lowest-ranked side remaining in the FA Cup after beating Leiston 2-1 to go into the first-round proper draw for the first time. Richard Greaves scored the winner for the ninth tier side against a team that plays two levels higher. 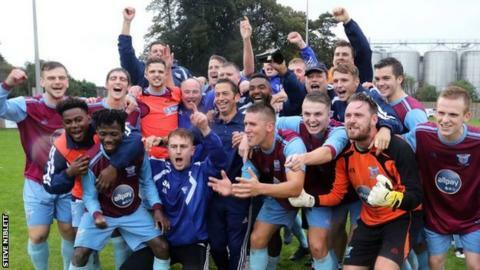 Hereford-based Westfields, who play in the Midland League Premier Division, have won six games in the FA Cup this season, a club record run. They were formed in 1966 on the back of England's World Cup triumph. A crowd of 760 - almost five times Westfields' average home attendance of 160 - watched the win over Leiston. They were one of two clubs in the fourth qualifying round who had started with an extra preliminary tie in the first week of August. Westfields have won £30,925 in prize money from their FA Cup run so far and will join former winners Bolton Wanderers, Coventry City and Portsmouth in Monday's first-round draw. Before their trip to Allpay Park in Herefordshire, Isthmian League Premier Division leaders Leiston were unbeaten in all competitions. Andrew Morris, the secretary and chief executive of Westfields who founded the club after being inspired by the feats of Sir Alf Ramsey's boys 50 years ago, said it was a "magical experience". "This belongs to the magic of the cup," 66-year-old Morris told BBC Hereford and Worcester. "It's unbelievable, I've seen scenes today that I never dreamt we would see. To win today, to get to the first round, is amazing. "When we started I'd have been happy to have a good run in the Hereford Senior Cup." Managerless National League side Wrexham face a replay against Stamford, who are three divisions below the Welsh side, after a Lee Beeson penalty earned the Daniels a 1-1 draw. Northern League Division One's Bishop Auckland, the lowest ranked team to go into the fourth qualifying round, were knocked out by Stockport County of the National League North. Solihull Moors got past Kettering Town 3-1 to reach the first round for the first time, and a victory in the first round would see them go further than Solihull Borough and Moor Green - the two clubs that merged to form the current side. There were two big winners on the day, with Kidderminster Harriers beating Southern League Premier Division side Weymouth 6-0, while National League club Eastleigh put the same number past Southern League Division One Central side North Leigh. Lincoln City go to a replay on Tuesday after their goalless daw against fellow National League side Guiseley, while the Imps' neighbours Lincoln United went out 3-0 to Spennymoor Town, who play in the seventh tier Northern Premier League Premier Division. You can watch the FA Cup first round draw live on BBC Two and on the BBC Sport website, which also includes live text commentary, on Monday at 19:10 BST.